If you're a horror movie fan, then chances are you've had a heated discussion about jump scares at some point. Whether you love them or hate them, they've become a staple of the genre. You know the drill: the swell of creepy music, the building tension, and then an explosive burst of sound and movement that makes your heart skip a beat and jolts people upright in their seats. For some, this can be seen as a manipulative tactic - if you have to rely on freaking out an audience with a loud noise, can that be considered a genuine scare? Or is it merely a cheap ploy used in lieu of taking the time to figure out how to actually leave someone with lasting terror? Personally, I'm not the biggest fan of jump scares. I'm much more likely to find myself laying awake at night thinking about a creepy figure who silently appeared in the background of a scene (à la The Strangers) than the sudden, ear-piercing shriek of, say, a demonic nun. But when used sparingly, I believe a jump scare can be the perfect way to leave an audience gasping after a chilling, slow build. That's exactly why one scene in Mike Flanagan's new Netflix series, The Haunting of Hill House, made me scream at the top of my lungs (no shame) and caused my boyfriend to leap off the couch in alarm - a literal jump scare. 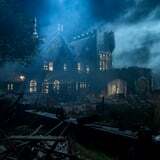 Warning: We're officially entering spoiler territory for The Haunting of Hill House! Proceed at your own risk. The scene in question goes down towards the end of episode eight, "Witness Marks." The remaining Crain sisters Theo (Kate Siegel) and Shirley (Elizabeth Reaser) are driving up to Hill House in hopes of rescuing their missing brother, Luke (Oliver Jackson-Cohen), from the demons that reside there. Their drive isn't a pleasant one, though - two episodes prior, Shirley stumbles upon what looks like Theo putting the moves on her husband, Kevin, and the matter still isn't resolved. They fight a bit. It's tense. Things aren't going well. That is, until a terrifying ice breaker reveals herself: the ghost of their dead sister, Nell. Nell (played by Victoria Pedretti as an adult and Violet McGraw as a child) spends much of the first half of the series plagued by visions of a truly horrifying ghost she dubs the "Bent Neck Lady." In adulthood, her experiences with the Bent Neck Lady seem more like night terrors - she wakes up covered in sweat, feeling completely paralyzed. But we eventually discover that the spirit is very real when Nell is lured back to Hill House and tragically killed by the ghost of her dead mother, Olivia. Nell is hanged, and it's revealed she's been the Bent Neck Lady all along. Nell, in all her Bent Neck Lady glory (think: white eyes, mottled skin, a dirty dress, yellow teeth in desperate need of some Crest), shoots forward between the seats of her bickering sisters out of nowhere, screaming. Shirley immediately swerves to the side of the road and Theo flees from the car, shaken to her core. As it turns out, the interaction is exactly what the sisters needed to open up to each other and finally mend the burned bridge between them. The emotional impact of Nell's nightmarish intrusion is a great example of how skillful Flanagan's series is at weaving together genuine horror with family drama, and his handle on scaring an audience in general. Though the jump scare still employs all the familiar tactics - a sudden burst of movement and crashing sound - Nell's appearance serves a purpose; she pops up to stop Theo and Shirley from fighting and bring them together so they can present a united front against the house. The Haunting of Hill House moves slowly at times, but sticking with the show is worth it. Flanagan seldom resorts to cheap scares to jolt viewers, which is why Nell's sudden appearance comes as such a shock. In fact, the moment is so freaky that it scarred a few members of the cast. "I watched [that episode] the other day and I was so, so scared. I screamed and I was still scared, so I screamed again," Oliver Jackson-Cohen, who plays Luke, told me with a laugh during a recent interview ahead of the show's premiere. "[Nell] broke me!" And how does it feel to be one of the people filming something like that? Elizabeth Reaser, who plays eldest sister Shirley, admitted that although she still has yet to watch the show for herself, she can confirm being in the middle of a scene like that is just as frightening as it looks. "Yeah, it was really scary when we did that scene," she said. "Because if someone came up right now behind me, I would jump, you know?" If you want to experience the scene for yourself, The Haunting of Hill House is now streaming on Netflix.